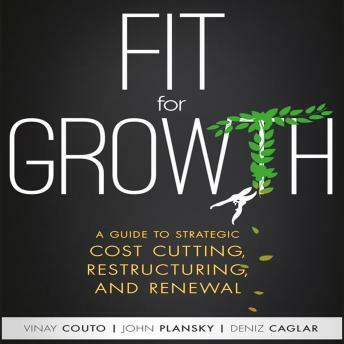 Fit for Growth is a unique approach to business transformation that explicitly connects growth strategy with cost management and organization restructuring. Drawing on 70-plus years of strategy consulting experience and in-depth research, the experts at PwC's Strategy& lay out a winning framework that helps CEOs and senior executives transform their organizations for sustainable, profitable growth. This approach gives structure to strategy while promoting lasting change. Examples from Strategy&'s hundreds of clients illustrate successful transformation on the ground, and illuminate how senior and middle managers are able to take ownership and even thrive during difficult periods of transition. Throughout the Fit for Growth process, the focus is on maintaining consistent high-value performance while enabling fundamental change. Strategy& has helped major clients around the globe achieve significant and sustained results with its research-backed approach to restructuring and cost reduction. Sustainable success is founded on efficiency and high performance. Companies are always looking to do more with less, but their efforts often work against them in the long run. Total business transformation requires total buy-in, and it entails a series of decisions that must not be made lightly. The Fit for Growth approach provides a clear strategy and practical framework for growth-oriented change, with expert guidance on getting it right.